Midrand Canopies is an approved Beekman Fitment Centre and is situated conveniently between Johannesburg and Pretoria, in a Secure Business Park (Tillbury Business Park Unit B2), 16th Road in Midrand, Gauteng South Africa (Cnr. George and 16th Road). Services include:Supply fitment and repairs of Bakkie Canopies, Rubberizing, Bakkie Racks, Securi-Lid, Tonneau Covers, Nudge Bars Bull Bars and Tow Bars. We supply and fit, Beekman Fibre Glass, Rhinoman Aluminium, RSI Stainless Steel and Strong Steel Canopies. All Fibre Glass, Aluminium and Stainless Steel products can be specially ordered to meet your requirements. Are you looking for quality Fibre Glass products? Looking for a manufacturers warranty with peace of mind? All Beekman fibre glass products come with a 2 year guarantee. Your product will be repaired or replaced should there be a defect or fault. Looking for something sleek smooth and sporty? Take a look at the Beekman executive range. Looking for something to plain yet stylish? Take a look at the Beekman standard range. 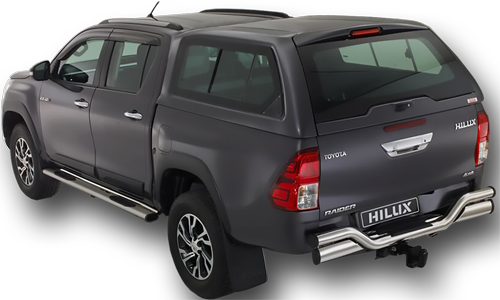 We have Fibre Glass Canopy products for Sale for all major vehicle manufacturers which includes the new Ford Ranger and Toyota Hilux. RSI Smart Canopy products and accessories are available for Single, Supercab and Double Cabs. The product is developed from Automotive Grade Stainless Steel, is completely Water proof, and has a lightweight construction. The unit can be ordered in any colour and comes standard with running rails. Gullwing Side Doors gives easy accessibility all around the vehicle. Standard features: Water proof, Colour Matching, Roof Rails, Front and Rear Glass, Lightweight Stainless Steel construction, OEM approved fitment. Rhino-cab is made 100% from Automotive grade aluminium. Manufactured to our unique design through which high strength and very low weight of under 65kg is achieved (Standard double cab) All canopies are manufactured using latest CAD technology. Welding is done at tolerance jig in order to ensure no deforming takes place during welding. The canopy is then finished in durable powder coat layer. Strong Steel Bakkie products, Custom Designed. Available in Fulldoor, Halfdoor, Hiline and Lowline. Optional extras are side opening doors, windows. Steel Canopies are super strong and sturdy, great for working vehicles.. From a comprehensive range of accessories to the finest handcrafted trim. 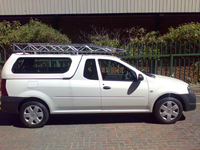 Contractors roof racks: Made to fit every make of Bakkie or Panel van, new or old, large or small. We will fit a rack onto any Bakkie. Order your bumper to bumper or bumper to windscreen rack. Perfect for electricians plumbers and builders. We can reinforce your rack to carry heavier loads depending on your requirements with Telestruts. Galvanized Steel racks work perfectly on any type of bakkie with or without a canopy. Bakkie and Canopy Racks are fitted professionally and correctly the first time. Bakkie racks are backed up by Various Accessories designed to make your vehicle more versatile and efficient. All racks are bolted together when fitted, It has been proven that bolted racks can withstand dimensional tension better that welded ones. All racks come with a lifetime guarantee! Rubberizing: This polyurethane coating sprayed onto a surface under high pressure which offers excellent protection against corrosion abrasion and impact damage. The rubberising protects your goods from moving around in the bin of the vehicle thereby protecting your load. 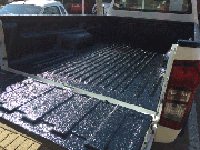 Rubberising for bakkies comes in standard 3mm or heavy duty 5mm. Rubberising can be done on half tonne bakkies, Long wheel base vehicles, double cabs, safari vehicles, trailers or anything that can be rubberized. Rubberising for Bakkies comes with a 1 year warranty on the product and workmanship. The Securi-Lid, a robust aluminium roller shutter load-body cover, makes your hard-working vehicle more versatile. It’s a quick and easy way to lock away your load without compromising your bakkie’s good looks. Strength, durability and cost-effectiveness make the Securi-Lid the ideal solution to covering your bakkie’s load. The securilid is weather proof and offers easy access from all sides. All Securi-lid roller shutter doors come with a 1 year manufacturers warranty on the lid and a three year warranty on the spring. Available in White Black and Silver. Towbars are available for light commercial vehicles and Bakkies only. This would include the Ford Ranger, Hyundai H100, Kia 2700, Isuzu KB, Toyota Hilux, Nissan Navara, NP300, Chev Utility and Nissan NP200. The Towbars available for these vehicles are: Double tube full step Towbar/ Goose Neck Towbar / Detachable and Fixed Head Towbars. Installation time ranges from 1-3 hours depending on the type of towbar required. Tonneau Covers are used to prevent dirt, rain and dust entering your load bin area. All Tonneau Covers are Leather embossed and double stitched. Ensuring the highest grade quality and comes with peace of mind Guarantee. Tonneau covers come in either a clip on or elasticated rope tie on. 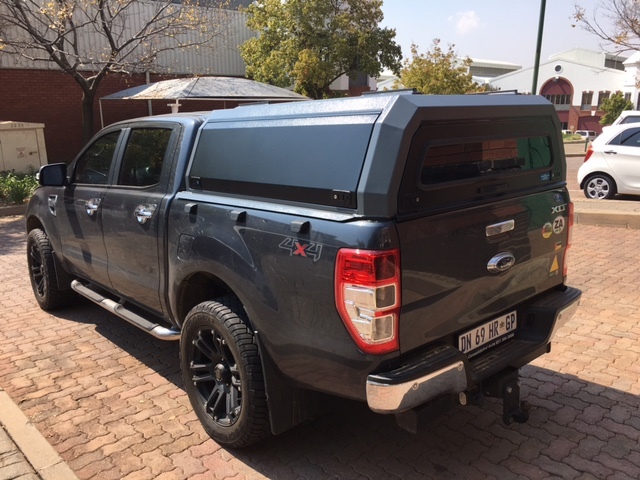 Clip on Tonneau Covers: Aluminum brackets are built onto the inside of the loadbin to enable the clip on cover to be effective, keeping the clip on cover in place and ensuring water and dust does not enter the top of the bakkies load bin area. Elasticated Rope Tie On Covers: The full kit is supplied for the rope tie on system, little plugs are placed onto the exterior side of the loadbin whereby the rope can snap onto. This provides maximum protection against weather. Choose your style and specify your design!